Nova Springwater is a wholly Australian Owned & operated company. Our water is entirely sourced from Australia, our bottles & labels are manufactured in Australia, and our water is bottled, labelled and packaged in Australia, therefore providing valuable employment to Australians. All Nova Springwater products are licenced by Australian Made Limited (AMCL) to display the Product of Australia logo. The Australian Made, Australian Grown logo is administered by Australian Made Campaign Limited (AMCL), a not-for-profit public company established in 1999 by the Australian Chamber of Commerce & Industry (ACCI) and the network of state and territory chambers of commerce, with the cooperation of the Australian Government. Food Standards Australia New Zealand (FSANZ) is an independent statutory agency established by the Food Standards Australia New Zealand Act 1991. FSANZ is part of the Australian Government’s Health portfolio. FSANZ develops standards that regulate the use of ingredients, processing aids, colourings, additives, vitamins and minerals. The Code also covers the composition of some foods, e.g. dairy, meat and beverages as well as standards developed by new technologies such as genetically modified foods. They are also responsible for some labelling requirements for packaged and unpackaged food, e.g. specific mandatory warnings or advisory labels. All foods and beverages sold in Australia must meet the requirements as set out by FSANZ. At Nova Springwater, we not only meet the FSANZ requirements, we do even more. All Nova Springwater is packaged in Single Use, 100% Recyclable, PET Bottles. Our bottles use 60% less plastic per litre than most water bottles in the market. As a result of our innovative and environmentally friendly packaging, Nova Springwater was also recognised as a finalist in the Sustainable Manufacturing category of the 2011 Australian Food Challenge award. HACCP (Hazard Analysis Critical Control Point) is an internationally recognised food safety system used by food producers, manufacturers and food service organisations, to assure food safety and quality. 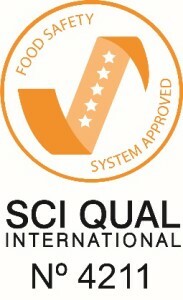 The Food Safety Handling Systems employed by Nova Springwater Pty Ltd in our production processes, have been certified by SCI Qual International as meeting HACCP standards. 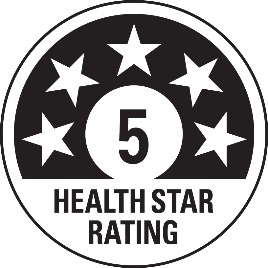 The Health Star Rating system is a joint Australian, state and territory governments and New Zealand Government initiative developed in collaboration with industry, public health and consumer groups. It is a front-of-pack labelling system that rates the overall nutritional profile of packaged food and assigns it a rating from ½ a star to 5 stars. It provides a quick, easy, standard way to compare similar packaged foods. The more stars, the healthier the choice. Nova Springwater carries the highest rating under this system – a Five Star Rating. 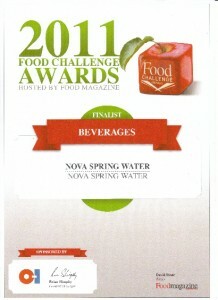 Nova Springwater was recognised as a finalist in the Beverages Category of the 2011 Australian Food Challenge Awards.